Microsoft Dynamics NAV, Microsoft Dynamics 365 for Finance & Operations, Business Edition – Making Tax Digital? As Her Majesty’s Revenue and Customs (HMRC) service strive to become one of the most digitally advanced tax administrations in the world, tax going digital is a hot topic. HMRC want to make the tax system more effective, efficient, and easier for customers to comply with. What does that mean for you? Making Tax Digital will be enforced in Phases. Initially businesses in the UK will be required to start using the Making Tax Digital system in April 2019, but only to meet VAT obligations. This is going to be a trail and the UK government has said they will not extend this requirement of Making Tax Digital for business beyond VAT until the system has proven to work, and certainly not before April 2020. This is all aimed to make it easier for both businesses and individuals to stay on top of their tax related affairs. How does Microsoft support Making Tax Digital? 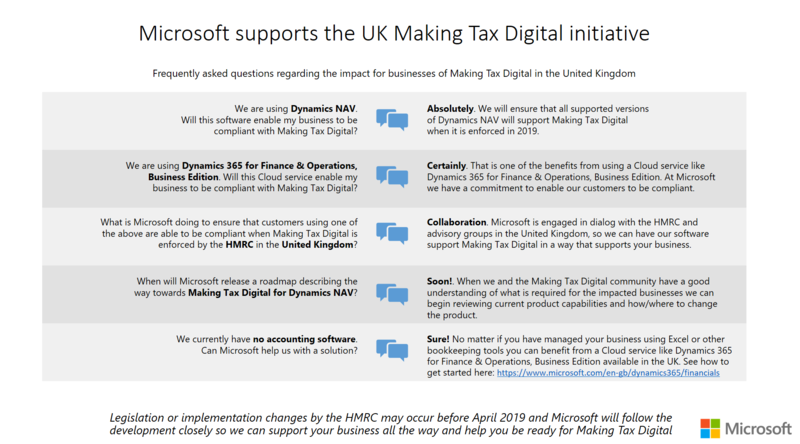 Microsoft are working to ensure that the supported UK versions of Microsoft Dynamics 365 for Finance and Operations, Business edition, as stated in the Microsoft Lifecycle Policy, will comply with the Making Tax Digital initiative. VAT reports are already supported electronically, and the technical requirements of the initiative are being discussed between Microsoft and HMRC. There are advisory groups set up to ensure that Microsoft functionally support Making Tax Digital before it takes effect for businesses. If you want to know more about the foundations for Making Tax Digital, please see this page from the UK government. http://www.totalenterprisesolutions.co.uk/wp-content/uploads/2018/01/iStock-532487159.jpg 591 591 Andrew Lees https://www.totalenterprisesolutions.co.uk/wp-content/uploads/2015/07/logo.png Andrew Lees2018-01-19 11:27:382018-01-19 11:44:25Microsoft Dynamics NAV, Microsoft Dynamics 365 for Finance & Operations, Business Edition - Making Tax Digital?